Considering what the franchise had done over the past few years, it wasn’t difficult to imagine the Cowboys having the best offensive line in football last season. Using three first-round picks in a four-year span on the O-line was an obvious attempt to bolster one area of the team, and it ultimately paid off, as that group dominated up front in 2014 and took the Cowboys to the playoffs. Dallas’s continued development in the trenches puts it right in the conversation with the other top position groups in the league: the Legion of Boom, the Green Bay wide receivers, and the Carolina linebackers. Every year, there’s at least one Cowboys O-line — a unit that ascends to the top of the pecking order at its position, redefining the team’s identity and what its outlook is by the end of the season. So, a week out (!) from the start of this season, let’s take a look at the six position groups that have the best chance to be called the best in football come Week 17. Dethroning Dallas is going to be a tall task. Unlike some of the other great (and healthy) lines from last season — Green Bay, Pittsburgh — the Cowboys maintained their excellence despite injuries. And now with undrafted first-round talent La’el Collins sitting on their bench, they’re in a better spot to handle bad luck than most lines in the league. If any group has a chance to challenge the Cowboys, though, it’s the Ravens. Baltimore dealt with its own injury issues last season, when a foot problem sent right tackle Ricky Wagner to the IR late in the year. Rather than letting undrafted rookie James Hurst get roasted on the outside, the Ravens slid All-World guard Marshal Yanda to tackle, where he just kept on ruining opponents’ afternoons. It takes one hand to count the number of guys who can do that, and I think Yanda is the best offensive lineman playing right now. He’s a savant in the run game, often getting a hand or a hip on a guy (or two) that he has no business reaching — all while still being a rock in pass protection, too. Schematically, though, the Ravens’ zone-running game starts with Jeremy Zuttah. Even with all of Ozzie Newsome’s other transactional wizardry, the move for Zuttah is still one of his best. Baltimore snatched the undersize center from the Bucs for a fifth-round pick before last season, and he proved to be a perfect fit for Gary Kubiak’s offense. Under Kubiak in Houston, Chris Myers made a living as a 280-pound center that survived on quickness and an understanding of angles, and the (maybe) 300-pound Zuttah cuts his path the same way. With Yanda on one side and Kelechi Osemele — at times, the most physically punishing guard in football — on the other, it makes for the best interior of any line in the league. The trade for Zuttah was part of the mass turnover needed after Baltimore posted some historically bad rushing numbers in 2013. The Ravens finished last in rushing DVOA that season and 30th in average yards before contact. Last year, their DVOA jumped 14 spots, and only the Chiefs and Dolphins averaged more yards before contact. Zuttah deserves some of that credit, but a full offseason for Eugene Monroe and sliding Wagner to tackle also had plenty to do with it. Wagner has developed into one of the league’s top right tackles, and although Monroe, who came over in a trade with Jacksonville, has never lived up to his eighth-overall-pick status, he’s a more than capable option on the other side. What makes this group unique (especially when compared with Dallas) is that it’s been pieced together over time without any of Baltimore’s own early-round picks. Of course, there’s some luck involved — like Wagner, a fifth-round compensatory pick, turning into a star — but Newsome and the rest of the Ravens staff deserve a lot of credit for understanding how important a great line is and for tinkering just enough until they found one. 2014 Winner: You tell me! It would make sense to exclude this position from the list for the same reason we left off quarterback — it’s mainly one guy — but running backs are a little different than signal-callers. Backfield attrition makes depth there more important than it is under center, and in an era when specialists matter more than ever, having a group of backs with diversified skills is a necessity. That being said, picking a consensus best backfield from last year was, well, it was not possible. Most of the better backs in football — Le’Veon Bell, Jamaal Charles, Marshawn Lynch — were backed up by a decidedly worse one, and I can’t give it to Minnesota after Adrian Peterson missed most of the season. The Bengals have a decent case, but I’d like to see Jeremy Hill for a few more games before I’m ready to hand that title to him and Giovani Bernard. As far as this year goes, though, it’s tough not to like the group the Eagles are trotting out. Sure, you can quibble with how much they cost, but that doesn’t matter when we’re talking about on-field production. Even if DeMarco Murray does get hurt, that’s why Ryan Mathews is here. Mathews was a solid runner when healthy in San Diego, and in this offense he’ll be a reliable option whenever he gets the chance. 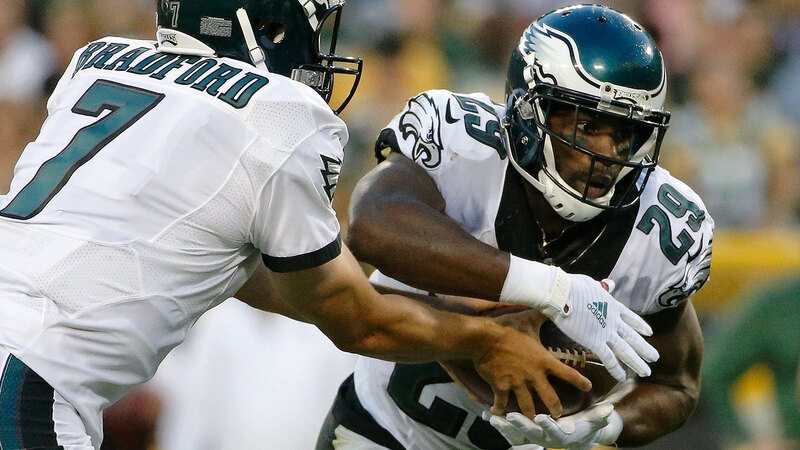 The pair provides a dangerous one-two punch that could even see some time on the field together — and that’s before you consider what Darren Sproles provides in the passing game. With that trio, the Eagles have a group that’s both deep and effective in a few different ways. No other team can make the same claim. If everyone were healthy, I don’t know if it would even be worth trying to find a team to surpass the Packers. There might be a larger gap between Green Bay’s pass-catchers, which includes Eddie Lacy, who is a horribly underrated receiver, and the rest of the league than there is with any other position group. Only, Jordy Nelson’s stupid knee ligaments now give a few other teams a shot. It’s tempting to choose Pittsburgh here. When it comes to top-level talent, the Steelers have most of it. Antonio Brown is the most effective receiver in football, and Le’Veon Bell is far and away the best pass-catching back in the league. 💯✊🏾👀 RT @ExcuseMyStep: "@L_Bell26: 1on1's…iron sharpening iron! #Juice pic.twitter.com/yAUMStBqqv" Oh yeah! 👏👏 Don't sleep on Le'Veon! However, the Steelers don’t have a ton of depth. Martavis Bryant has looked magnificent at times, both last season and in the preseason, but he’s going to miss the first four games of the year through suspension. Behind him, it feels like Markus Wheaton is destined for the never-ending “This is finally the year!” treatment every offseason, and rookie Sammie Coates appears to have a long way to go before he’s a realistic option. Detroit has its own questions, but with a little bit of projection, it’s not hard to picture that group taking the top spot. Calvin Johnson was slowed down by injury last year, but even if we can’t discount his injury history, 14 healthy games of Megatron still rivals just about anyone. Across from him, Golden Tate looks like one of the shrewdest free-agent signings in recent memory after a 99-reception year in 2014. The array of elements Tate brings as a receiver is crazy: He’s a deep threat, a yards-after-catch monster, and one of the more sure-handed players in the entire league. Plus, only Rob Gronkowski, Dez Bryant, and Martellus Bennett — all giant human beings — had more broken tackles for a receiver than Tate last season, per Football Outsiders. The Johnson-Tate duo rivals anyone else in the league, but it’s the other pieces that aren’t quite there yet. We don’t have much reason to believe Eric Ebron will be more of a factor in his second season, but he’s still the 10th overall pick from only a year ago. There’s talent there, and the Lions do need a third option to eat up some targets. Also, if the preseason is any indication, Ameer Abdullah can do a few things with the ball in his hands. Please show us you deserve all of this, Matthew Stafford. We could give 2014 to Buffalo and, with the addition of Nick Fairley and the return of a healthy Chris Long, call 2015 for St. Louis. But that feels like cheating. The point here is to pinpoint a unit that can overtake the no. 1 spot, and even if Buffalo was the best group last year, St. Louis currently has a firm grasp on the top spot. Miami is a little further down in the pecking order, but there’s a chance this crew matches anything the Rams or Bills do this year. The production Ndamukong Suh adds is obvious. He’s a dominant interior pass-rusher who can play anywhere on the inside, and he should ensure that Miami’s run defense doesn’t crater like it did in the second half of last season. What makes Suh truly valuable, though, is how he frees up the rest of this line. We’ve already seen it with Earl Mitchell, an underrated penetrator who picked up two tackles for loss and a sack against the Falcons last week. Mitchell can be a mismatch when single-blocked, and with Suh next to him, that shouldn’t be a rarity. Any extra attention paid to Mitchell will also mean fewer resources devoted to the outside, where Cameron Wake still lurks. Wake is 33, but before he got dinged up last year, he still looked like the explosive nightmare he’s been since coming into the league. If he has lost anything, Suh’s presence should be enough to make up for any drop in raw ability. 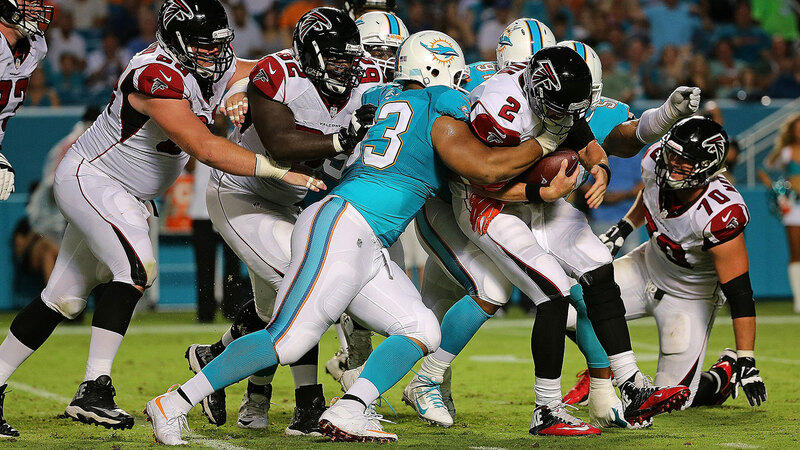 Wake has never played with a player even approaching Suh’s level, and for years, opponents have been able to devote entire protection schemes to keeping him off the quarterback. Now, he’s the second-most dangerous player on his own line. Add double-digit sack threat Olivier Vernon, who is somehow an afterthought here, to the mix, and that’s a scary group. At linebacker, Carolina has had a similar stranglehold to what the healthy Packers enjoy at receiver, and it’s possible that group gets even stronger with rookie Shaq Thompson in the mix. Philadelphia’s unit still might be better, though. DeMeco Ryans is listed as the starter opposite Kiko Alonso on the inside, but go take a look at the money Chip Kelly just threw at Mychal Kendricks. Alonso and Kendricks are getting the snaps here, and man, those two can fly around. This year’s Eagles actually have a lot in common with the Panthers defenses from the past couple of seasons. Philly’s front four is a talented, deep group. The pass rush isn’t going to be a problem, and there’s still enough heft in the middle to slow down the run. Like Carolina, Philadelphia’s issues are in the secondary, especially at safety. That makes what Alonso and Kendricks can do in coverage even more important. They’ll rival Luke Kuechly and Thomas Davis as the best pair of coverage linebackers in football, and there’s a real chance they’re even better. Oh, and that’s not even mentioning Connor Barwin, who’s asked to do a little bit of everything and does much of it well. I know, I know. This title will belong to another team when it’s pried from the Legion of Boom’s cold, dead fingers. But this year looks like it could provide a bigger opening than there’s been in a while. Kam Chancellor is still missing from camp, pissed off about a deal he signed before every other Seahawk really cashed in. Seattle’s relying on Cary Williams as its outside corner across from Richard Sherman, and at a certain point, we have to stop assuming that putting on that jersey is enough to turn anyone into a reasonable NFL cornerback. Meanwhile, Earl Thomas was just cleared to start playing with contact. So, all I ask is for you to at least hear me out with the Vikings. Cleveland has a claim here, but Minnesota’s ceiling is considerably higher. If the Vikings can make a push for the playoffs, Harrison Smith should finally start to get some recognition this year, as he deserves mention right alongside Devin McCourty and Eric Weddle as the best safety in football not named Earl Thomas. Captain Munnerlyn was the no. 1 cornerback on an excellent Panthers team two years ago, and for Mike Zimmer, he’s destined for life in the slot. 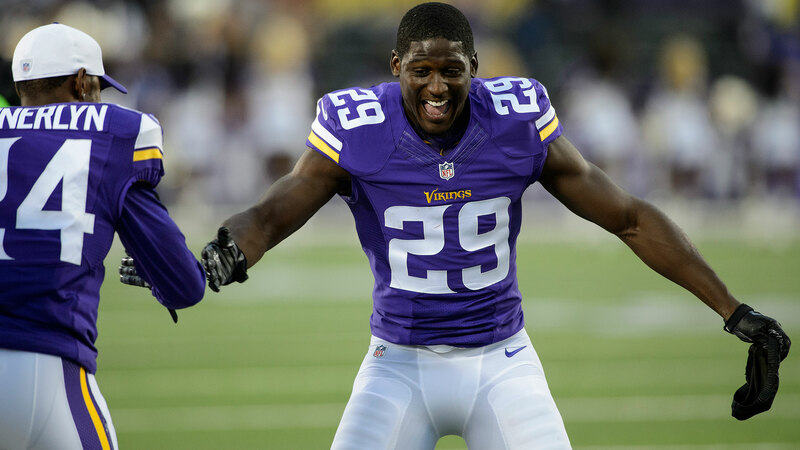 That’s a luxury most teams don’t have, but on the outside, former first-round pick Xavier Rhodes is set to take a giant leap right into the class occupied by players like Desmond Trufant, Vontae Davis, and Jimmy Smith. If it all breaks the right way, Trae Waynes will be a reliable no. 2 corner by the end of the season. The 11th overall pick has some work to do before he’s there, but Minnesota’s plan isn’t hard to see: The Vikings know they have the pieces in place, and with the talent and depth they have in the front four, they were another high-quality cornerback away from having a top-level pass defense. Much of the excitement in Minnesota is around the development of Teddy Bridgewater and the return of Peterson because of course it is. But in his first year, Zimmer took the Vikings from 30th in pass-defense DVOA up to 19th. While a challenge to Seattle might still be a bit much to ask, another even bigger leap into the top five isn’t at all beyond this secondary’s ability. This doesn’t include pass-rushing outside linebackers.